Scott Melton has held the position of Director of Sales & Execution of FANUC America's West region since 2008. He also manages the company's offices in Lake Forest and Union City CA, and Seattle, WA. 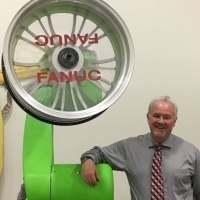 Melton joined FANUC in 1988, and has held a variety of management positions in the company's sales, arc welding, material handling, and laser segments. Melton has over 30 years of robotic automation experience. Prior to joining FANUC, Melton worked in the welding fabrication industry for GE and P&H Mining Equipment. Melton holds a Bachelor of Science degree in Industrial Technology - Welding from Utah State University and an MBA from Letourneau University.